NOTE: As of January, 2016 this plugin has not been updated in over two years. If you use this plugin on your site, it may have compatibility issues. We will check the plugin link periodically or remove this article. The plugin may still work (we are not currently using it) but use at your own risk. How do you deal with all the lovely comments on your site? If someone asks a question about your post, what is the best way to reply? Should you reply in the comments and risk that they don’t come back to see your reply. Or should you send the reply in an email, in which case it looks like you don’t reply to comments left on your site. Dilemma. This is where the ReplyMe WordPress plugin comes in to perfectly deal with this dilemma. Of course a visitor always has the option to click the little box that gives them the option to subscribe to comments on a post. But this can be irritating because then you subscribe to ALL comments and replies and on a popular post, this can be overwhelming. A reader usually only wants the answer to their question, not everyone else’s! So instead use the ReplyMe plugin to automate the reply for you. When a reader posts a comment or question on your site and you write a reply to their comment, ReplyMe sends them an email with their original comment (as a reminder), your reply (because it’s so awesome) and a link back to the post so they can leave another comment or reply (more page views and visits). Now you can be sure that all comments can be answered on the site and the writer certainly gets to read your reply. 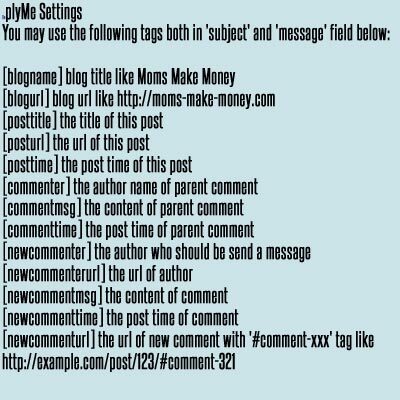 It makes it more obvious to other visitors that you reply to comments and can set a dialogue going in the comments that adds value to your post. The ReplyMe plugin is extremely simple in its set up and very easy to use. Short codes are little snippets you can use to pull in information to your email. This means that you can automate the emails easily to personalise them to the post and the person leaving the comment. Let’s start with the email subject line. Then looking at the body of the email itself, you can use the short codes above to personalise it in any way you like. A default email is already set up and if you aren’t sure about making any changes, then none are absolutely necessary. The short codes will pull the information from your site and your post to go into the email. You can also use html in the usual way to make links to the post or to your social media. Want to check out how this works in real life? 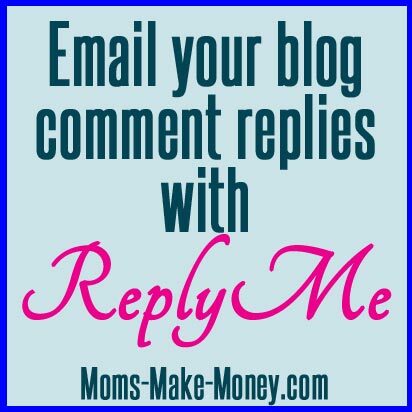 Then do drop over to any of the posts here on Moms Make Money and ask me a question. I don’t have time sadly to reply to all comments, but I do try to answer all questions asked – put ReplyMe at the end of your question to make doubly sure that I will reply on the site so that you will get the ReplyMe email. Other options – Commentluv Premium version includes ReplyMe options too. I’d love to know what you think of this Plugin. How do you usually reply to comments on your site? Reply in the comments, send an email or even both? Do you have any suggestions for how to engage your readers and get a conversation going, get readers back to your site? Fantastic post Deby! I’ve been out of the loop a bit with starting school, but had been getting many of these e-mails. These are fantastic, especially when you may not have time to go back and check if there was a reply done. Thank you so much for the easy directions. I’m installing it now, but will tackle the customized email later. Pinning this so I don’t forget! 😉 Hope all is well your way!! Does this work with Blogger too or only WordPress?? Sorry Cindy, its just for WordPress. Cindy, I’m on Blogger and I installed IntenseDebate and it is set up in a very similar way. I can reply to comments straight from my email now and it emails the commenter as well as placing the reply on their original comment on the post. Maybe its time to consider a move over to WordPress. Don’t forget about the free website setup service I offer. The full Blogger to WordPress redirection service should be ready for launch in a couple of weeks too. This is great. The only problem for me is I have a free blog on wordpress.com. I’ve been meaning to move my blog to self hosted on wordpress.org but I’m a little nervous. Any tips? Or can you point me in the right direction of where I should start? Thanks. Well you could always take advantage of the free website set up service from Moms Make Money! I’d be happy to set you up a free self-hosted site as well as pay for your domain name and hosting for 12 months. The full site transfer service isn’t yet launched, but you could sign up for the free site now and then once you are ready, set up and familiar with it, move over from the old site. I would transfer your posts and comments, photos etc. But WordPress.com does make an annual charge for the redirection. I think its about $13 to maintain the old site and redirect users over to the equivalent page on the new site. Great post! I just installed it and sent myself a test to see how it works. Here is a question – how do you get your framed photo to show up in the reply? You need to set up a profile with Gravatar.com with your email address and then when you comment, it collects the photo from your profile. Great post! I am bookmarking so I can come back later when I have more tine to try and set this up. Thank you so much for sharing! This is so, so helpful! I’ve been wondering how fix my blog to do this! Pinning to come and do later! I have the same question. Does this work for blogger, or just WordPress. You always know just what I need! Thanks for the amazing amount of tips you provide! Have a wonderful day! Hi Brooke, this is a WordPress only plugin – sorry. I’m not a Blogger user so don’t know if there is something similar you can use – perhaps one of the readers will provide an answer. Hi Brooke (Sorry about hijacking your comments, Deby!) Here’s my take: I’m on Blogger and I installed IntenseDebate and it is set up in a very similar way. I can reply to comments straight from my email now and it emails the commenter as well as placing the reply on their original comment on the post. Thanks so much for letting all the Blogger users know of a great alternative to this ReplyMe Plugin for WordPress. I knew someone out there would know! Hey, Thats great..will try it out..thanks. does it work for no reply bloggers too?? If someone hasn’t submitted their email address then it won’t be able to work, but if your site has a box where they enter the email address when they commment, this is ideal. It really is a dilemma! =) I’m not on WordPress, but this seems like a great solution! This is great info. THANKS! I’m saving it in Evernote for next time I update plug ins on my site. This is a great answer to my own dilemma. I hope I can make it work! Thanks for sharing. If you find an alternative, do leave us a comment. Yes, it’s just in time. It’s hard to decide one or the other, email or comment reply. This plugin means you can do both with half the work meaning replies shown on your site and replies sent to the reader. I have this plugin and absolutely LOVE it! It saves me so much time and effort but still makes sure my readers get their replies. Thanks for sharing this at the Pinworthy Projects Party! I’ll be featuring you on Facebook, Twitter and Pinterest this week. Thank you, thank you, thank you! And can I just say, Thank You! I have been in a quandary about this recently and was just about to do a post asking for tips on the subject. Now I may do a post with the solution and if I do I will be sure to link to your post. Thanks so much for letting all the Blogger users know of a great alternative to this ReplyMe Plugin for WordPress.